Octavio Abúndez’ outdoor installation is composed by three-dimensional representations of the Roman numerals 1 through 12, traditionally used to represent the hours, in a singular spatial arrangement. Through the multiplicity of perspectives, reflections and depths created by mirrored surfaces, the installation seeks to produce a subjective experience of time. A time which is free and variable in its perception; connected with the relentless succession of day and night, but hopefully alien to the utilitarian, mechanical and necessary use of time in cosmopolitan life. 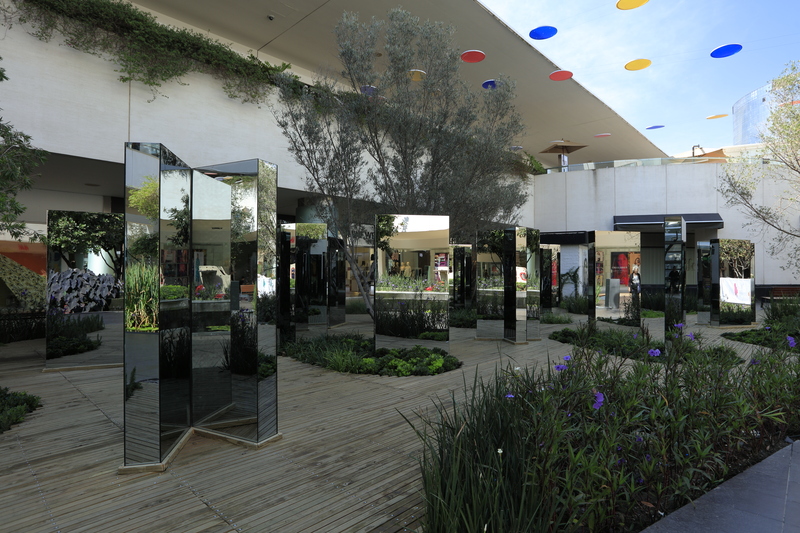 All the elements of the installation, as well as the shopping mall environment, are designed to make the visitor have a sensory walk through this mirror maze in order to activate his own perception of time.